I have worked on my berries 3 or 4 times, in small bits of time. So far I’ve finished tying up the June-bearing raspberries, the Marion blackberries and cut down 1/2 of the every-bearing raspberries. 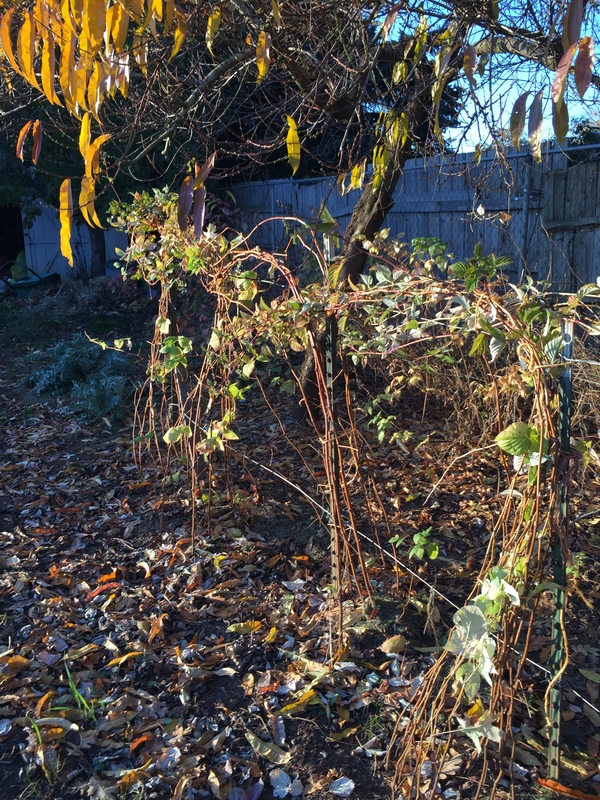 This year, I am going to cut down the entire patch of ever-bearing ones, as that is a choice. Rob wants to re-string the wire that was there when we moved in. It is in bad condition. 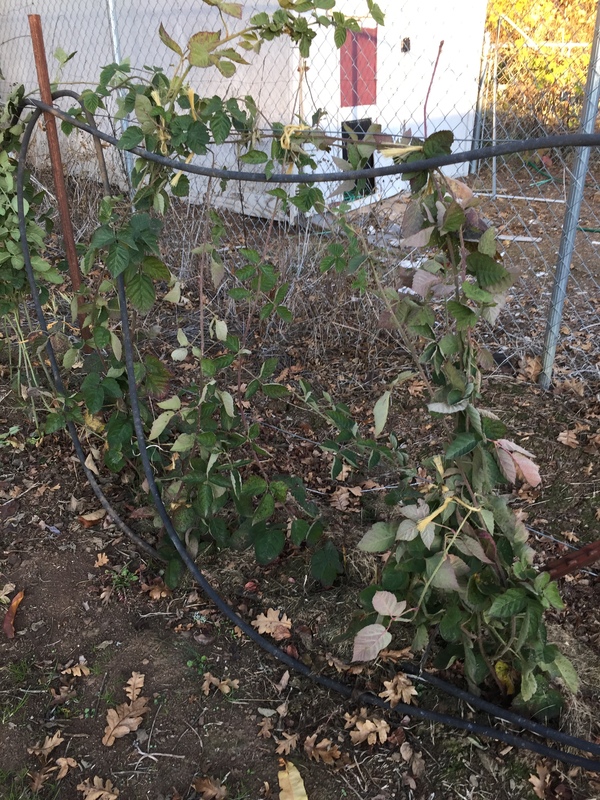 According to the internet, if you cut all canes down, you will get one large crop mid-late summer next year. I’m fine with that. The June-bearing ones are finally old enough to give me some berries in the first part of summer, and I’ll rely on the other patch at the end of the season. It’s worth a try. It was a very dry summer. I don’t think there are as many canes on the Marion blackberries as there would normally be. Still, I’ll fertilize and care for what are there. I can go to my sister’s house and pick wild blackberries if I need more next summer. She always has lots of those. I have shopped until I’ve dropped! I have been to the store so many times, I’ve lost count. It’s become comical. I’ve purchased every sale and bargain item I regularly use from at least 5 stores that are near my house. I’ve bought hams, turkeys, baking ingredients, dairy products, goodies, produce galore, normal items such as sugar, treats such as peppermint mini marshmallows, and everything in-between. Or so I thought. 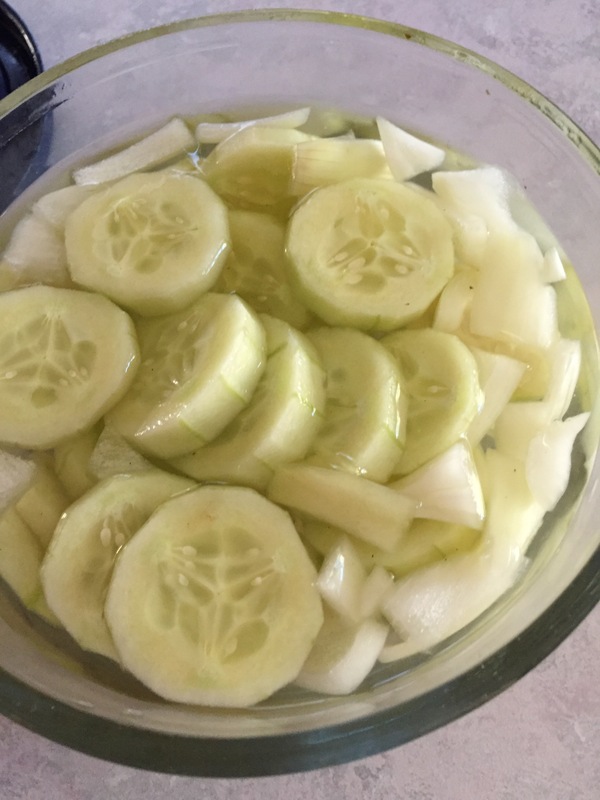 I no sooner got home and began to make cucumbers (with marked-down cakes) and onions in a vinegar-sugar-salt and pepper mixture, which is a salad Rob likes to eat frequently, than I realized I was out of sweet rice wine vinegar. I substituted, but went back for some the next day. I got that, and no sooner got home than I went to make something….and I was out of cornstarch. And, so it went. “I’m out of yogurt, honey,” was the next cry! I just had to laugh. I was able to use all the grocery money and then some, my Ibotta money, my Bottle Drop money, and then some. I actually had fun gathering all these things, but now, I’m tired of thinking, so will cruise along on what I got for the next few weeks, and only need to get produce and milk. Or so I think:). 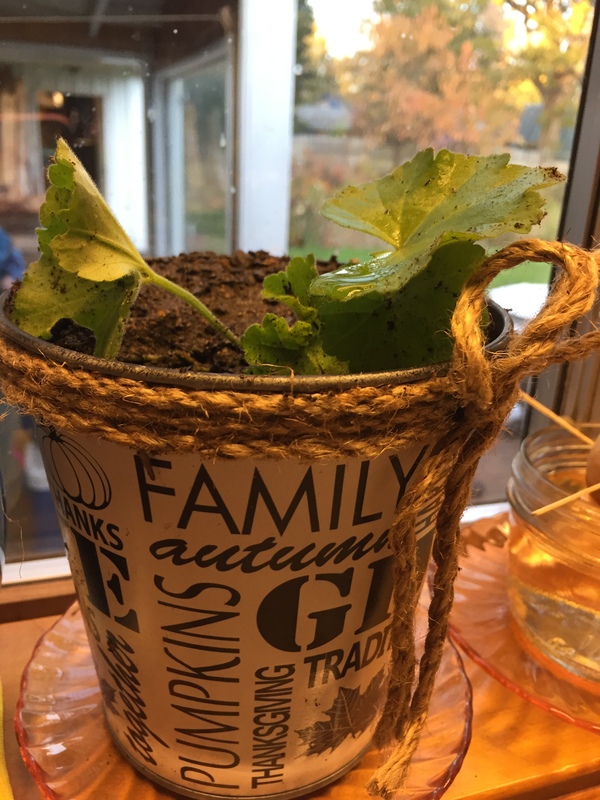 I re-purposed a little container from last Thanksgiving, by putting a geranium start in it and placing it on the windowsill. There were 5 tiny geraniums that volunteered in the compost heap, and this is one of them. The other 4 went into a large pot, and I put that in the greenhouse to see if they will winter over. Jake planted some seeds my friend, Jeannie, sent him. There is a little Columbine plant in the corner of the pot, just in case he forgets about the seeds and they die–he will have something, I hope. That went in the greenhouse, too. Last night, we had a slumber party with Jake and his older sister, Caitlyn. (She’s in her 20’s and works full-time, so it was a treat to have her). Patsy played games with them after church, we watched the British Baking Show on Netflix, and ate sandwiches. This morning, we went swimming at the YMCA, and I took Caitlyn to a natural store where she could get some gluten-free rolls she really enjoyed eating here. (I bought gf cornstarch, for one thing!). We also hit up Winco for yogurt (much better price), and she got some groceries she needed. We can’t beat the price of the $1.17/lb. ham they have right now. It was fun to spend some time with her. We used to spend quite a bit of time with her when she was little, but time has a way of passing, and those days are understandably rare any more, so it was special to me to have her spend a night on my couch once again. I did some cleaning and organizing for Thanksgiving. I started cooking the things that could be made ahead, such as cornbread I made and froze, to add to the dressing later in the week and some candied walnuts to add to the sweet potatoes. We should have a great day on Thursday, and every day before that promises to have a little holiday fun in it as well! I hope you week is shaping up well, also. Happy Thanksgiving to you and yours! I hope Jake’s seeds grow! Thank you. I hope they do, too, but since this is November…….Anyway, he had fun planting them. I have never had any geraniums volunteer so I was surprised by that. I am trying to keep from buying too much this holiday season. I did take advantage of a bunch of great sales last week but it seems that I cannot remember that there are only two of us here except for just a very few days at Christmas. My inclination is to buy 6 of everything! I am hoping that Jake’s seeds grow! I think I am still adjusting to the smaller family size, but since we often have extras here, the food still seems to get eaten. I cannot imagine there only being 2 people to eat food—I’m sure I will be over-cooking, as always, but worse:). There are times I still cook for 11—and that’s been 15+ years since I did that–old habits die hard! Yahoo! Jake-the-green-thumb-gardener planted the seeds and I bet they will do better than mine! It went from 90 degrees one day to 40 degrees the next and hasn’t warmed up yet. This has been the strangest fall. Will the weather ever be normal? My plants are just sitting in the garden looking at me not growing. If Jakes’ start growing, you will need to get an internet live camera and turn it on the pot so we can check it all day long to see how much they have grown. I think Rob put the pot in the greenhouse, so it has a hope of growing. The weather is odd here, too. We are finally getting frost in the mornings, then pretty warm and sunny in the afternoons, then very, very cold at night. Those wood fires are feeling really good these days!!! Have a wonderful Thanksgiving. When ever I go shopping, that night someone always says we are out of something. It drives me nuts. I bought more rice vinegar last week because I noticed we were almost out. 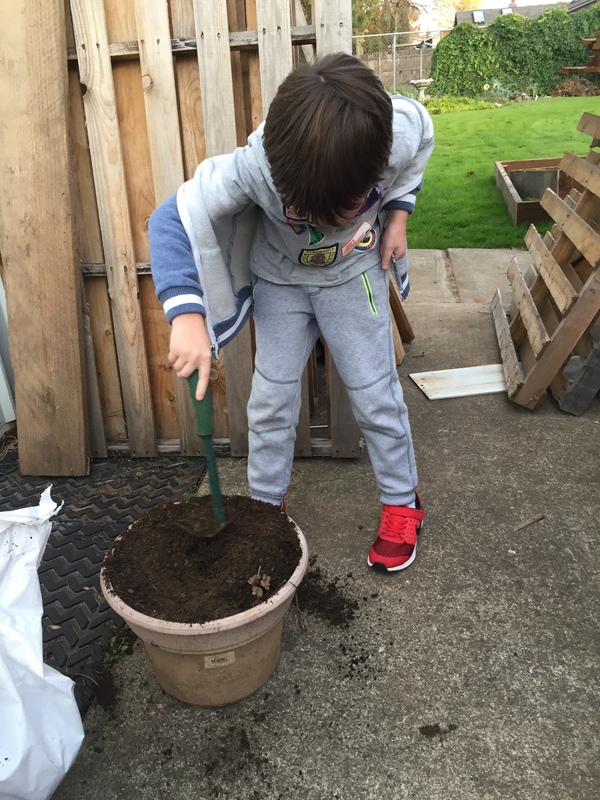 Hope Jake’s pot of seeds will grow into lots of lovely plants for him!